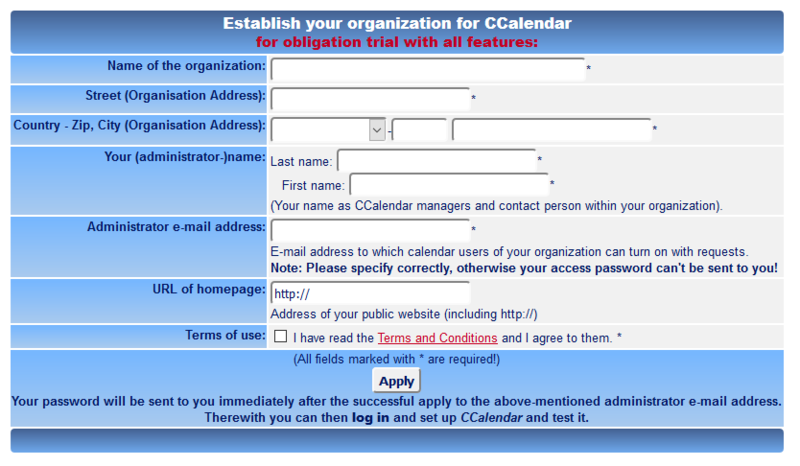 For first time use of CCalendar go to free test account" in the menu and create your own Organisation Account. Therefore fill in the form with the details of your organisation as well as your personal details. Please make sure to enter the "Administrator E-Mail Address" absolutely correct. This is the e-mail address where you receive your administrator password immediately after sending the filled in form! Shortly after sending your form you should receive your administrator password on the e-mail address provided in the field "Administrator E-Mail Address". Therefor please check your inbox. With the "Administrator Account" and "Password" that you received via e-mail you can log into CCalendar in the Menu "To Calendar" for the first time with all configuration rights. 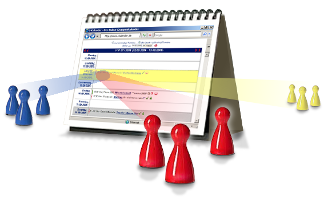 "CCalendar is as yet the best amongst all existing!"